Published 13 Oct 2010 at DVHH.org by Jody McKim Pharr. Dennis is member of the Arbeitskreis donauschwäbischer Familienforscher (AKdFF), the Association of Professional Genealogists, and numerous other genealogical associations. Dennis and cousin, Hans Martini, have developed two power point presentations entitled “A Brief History of the Donauschwaben” and “The History of the Donauschwaben in Mercer County, NJ”. These have been shown to numerous groups and associations. He also lectures on various genealogical topics and writes genealogical articles for several newsletters and web sites. He has written two family history books to date, The Hinkel Family from Hesse, Germany to Schuylkill County, PA and From Batsch to Trenton – The Trip to America in 1913 by the Lorenz Helleis Family. 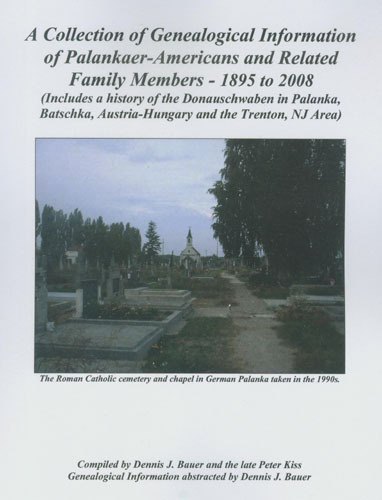 In 2008 Dennis completed 25 years of research and published A Collection of Genealogical Information of Palankaer-Americans and Related Family Members - 1895 to 2008. This work includes a brief history of Backa Palanka and the Donauschwaben. The book is dedicated to the memory of fellow researcher and Palankaer Peter Kiss and features over 500 Palanka related obituary abstracts, ship passenger lists, U.S. draft registrations and Palankaer-American addresses. Contact Dennis at his email address if you are interested in obtaining a copy of any of these books (Donauschwaben@mail.com).